Mrs. Sue Mark is the director of the Rosa International Middle School Orchestras. For the past 19 years she has built the program from 40 students to over 100. The orchestra has received numerous awards in competition including Superior ratings and best overall orchestra awards. Mrs. Mark has guest conducted the New Hampshire Eastern Regional Junior High School Orchestra and has been recently selected to conduct the All South Jersey Orchestra in January 2018. 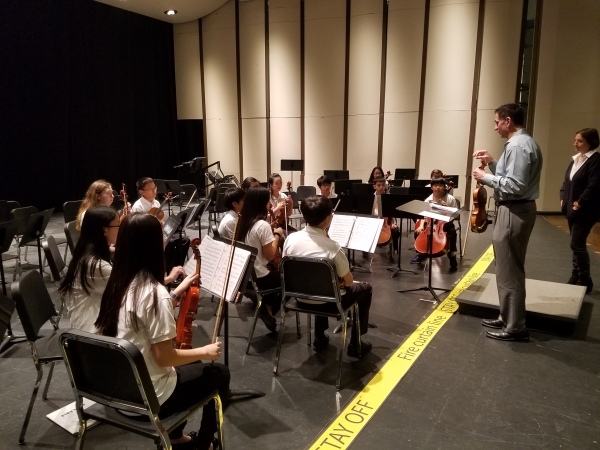 The Rosa Orchestra is a string orchestra made up of approximately 90 students in grades 6 - 8 who have been studying a string instrument (violin, viola, cello, bass) for at least 2 years. The orchestra rehearses once a week during the school day (Thursdays from 8:20 - 9:05) and has scheduled rehearsals after school (always notified in advance). This is a graded class and grades are based on the criteria set forth by the school and the district for all music groups. See the link to the left for further information on grading policies and procedures. Rosa's orchestra performs a variety of music at various levels, chosen to accommodate the wide-range of abilities in the group. The music will be challenging beyond the elementary experience, and based on the average abilities of the group. Anyone interested, and of the required musical level, may join the Rosa String Ensemble for a more challenging course of music. As with band, orchestra members will be required to attend weekly lessons in order to develop musically and to adequately prepare music for performances. The Rosa String Ensemble is made up of 12 - 16 (varying from year to year) string players who play quartet music. This ensemble rehearses after school and during regularly-scheduled lessons. In the past, the String Ensemble has performed in Philadelphia, presented and performed at the N.J. Educator's State Convention, for the seniors of Cherry Hill, for the I.B. visitors and various school functions. In the past, they performed at the wedding of two staff members, and each year they tour the elementary schools to promote the string program in Cherry Hill. This group is by invitation only and performs a more difficult level of music which requires extra time on the part of its members.